If you are fan of the Western style, you would know that a cowgirl or a cowboy hat is definitely one of the essential items that you should have when you dress yourself. The cowgirl or cowboy hat is, in fact, one of the hats that appeared first in the American history. You can check out the brief history of this interesting hat in this article as follow. With the long history as well as the raising in popularity, hat manufacturers offer a wide range of cowgirl and cowboy hats on the market. You have thousands of choices in various styles, colors, and materials, to consider if you want to choose the best cowgirl hats on the market. If you are still feeling overwhelmed by all of the options that you have on the market, take a look at this article below for the most popular and well loved cowgirl hats you can find on the market. First, let’s take a look at a red cowgirl hat with the white trim. This cowgirl hat might look simple but this classic look will never steer you wrong in any Western-themed party for sure. If you want to be a Jessie of the Western world, this is the hat that you can’t miss. It can be an ideal costume accessory for Halloween, theme parties, and just for fun as well. This cowgirl hat is made of high quality felt material. Thanks to the high quality material, this hat is soft and smooth on the tough. It is not too hot and not too cold as well. In addition, this cowgirl hat fits comfortable. There is a chin strap attached to the hat to ensure the hat can stay secured on your head in case of a high wind. 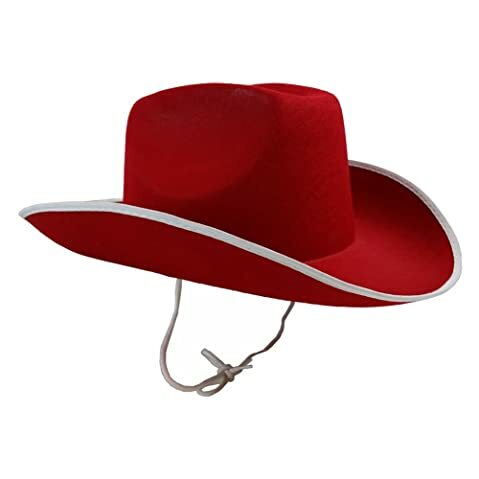 The color red of this cowgirl hat is bright and vivid. It is so sharp and durable as the shade of this color will not easily fade over time. Overall, this hat has a firm and sturdy construction that will last for several years. The brim of this cowgirl hat can be shaped though, to form the style that you want. Keep in mind that with the felt material, you need to take extra care of this hat to ensure that it will last for a long time. For various effective methods for cleaning the cowgirl hats properly, you can take a look at this informative article https://thebesthat.com/shape-cowboy-hat-ultimate-guide/. This cowgirl hat is for younger ladies who want to become a rodeo princess. 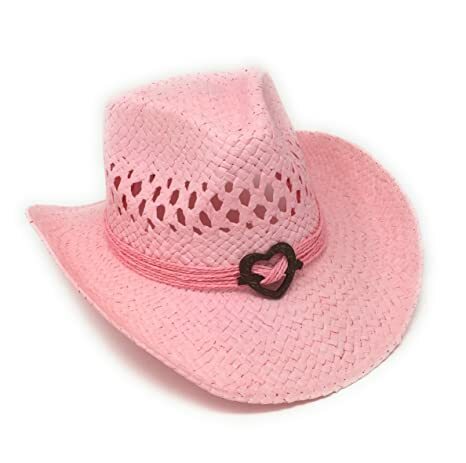 Make the dream of your child come true with this pink cowgirl hat. 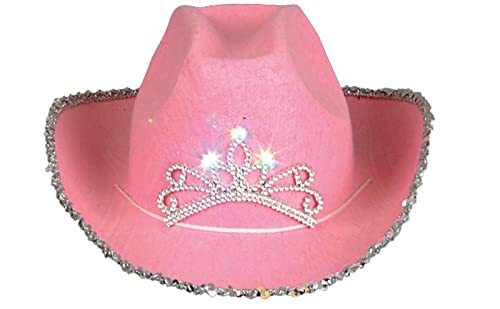 This cowgirl hat is made of 100 % of felt material with a pink-light-up tiara. With the tiara, the hat has a glamorous and princess-y look. This hat features the Texas rancher style for a wide west part or country themed event. You can follow the article best kids cowboy hats to buy for your little ones for more choice. This cowgirl hat is made of the premium 100 % of felt material. This material is undoubtedly soft and smooth on the touch. In addition, it is very well ventilated to keep your little kid’s head cool and comfortable all of the time. The hat is also very lightweight so that your kid never feels any burden even though she has to wear the hat for a long time. Besides, there is a lining built inside the hat to prevent the felt material from rubbing your kid’s forehead. As a result, your kid will not feel irritated or uncomfortable when they have to wear this hat all day long. Last but not least, this cowgirl hat comes with a chin cord, which makes sure that the hat can stay securely on your kid’s head. So no matter how active your kid is, the hat will never fall down. 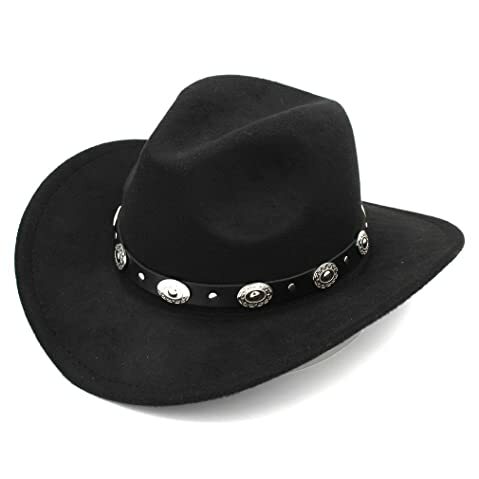 Are you looking for a black cowgirl hat? It is quite hard to come by a black cowgirl hat made with straw on the market. Here is the best option for you. Besides black, you can choose other options of colors such as chestnut and beige. It features the classic Western cowgirl design. This cowgirl hat is made of 100 % of woven straw material. The material is soft and lightweight. Not to mention that it is one of the coolest and breathable materials that you can find on sales. In addition, it features an anti-sweat band, which helps to wick moisture away and keep your head cool and dry all of the time. This band is also elastic and stretchy so that it can offer you a comfortable fit. The head band is available in various styles for you to choose from including braided and beaded style. The brim of this cowgirl hat is shapeable so that you are free to personalize the style of the hat to the look that you want. All you need is to bend the brim and you don’t have to steam the hat. Not to mention that the brim of the hat is wide enough to provide you a lot of shades for your face, your ears and your neck. Not to mention that the straw is woven tightly enough to prevent the sunrays from getting direly into your face. With this hat, you can wear it when you go camping, hiking, travelling, and taking part in other outdoor activities. You can also wear this hat when you go to the beach as well. Here comes another straw cowgirl hat for your consider. This hat is made of 100 % of straw. There are 4 options of colors for you to choose from including coffee, black, pink, and natural. It features a high crown, with a string tied and wired along the brim. 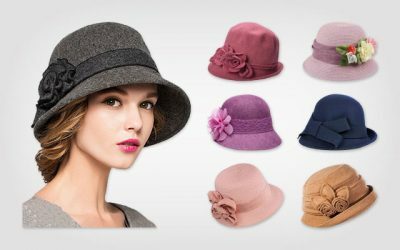 The straw material of this hat is of premium quality which is thick and yet lightweight and comfortable to wear. This hat is woven nicely with enough room for extra ventilation and breathability to keep your head cool and comfortable all of the time. This hat also comes with an elastic band built inside the hat. The interior sweatband is super elastic so that it could snug perfectly and comfortably around your head. There is also a chin cord which helps this cowgirl hat to stay secured on your head for a long time. The brim of this hat is 3.5 inches in width. It is solid and firm so that it will not become flimsy in case of a high wind. In addition, you can shape the brim to the style that you want to as well. Moreover, you can also crush the hat and put into a small bag, making it easy for storage and carrying around. Like other high quality cowgirl hats for women that you can find on the market, this straw cowgirl hat is well-built with a solid and sturdy construction that will last for a long time. 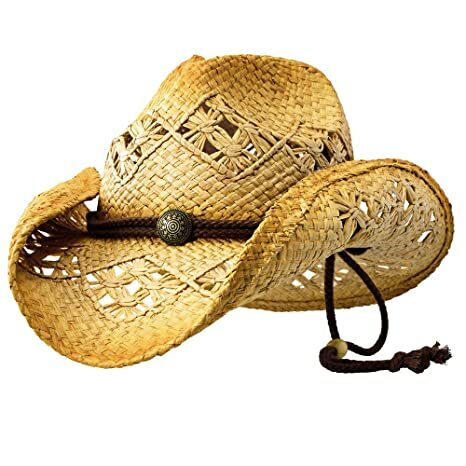 This cowgirl hat is made of Raffia straw, one of the most premium types of straw that you can find on the market. It also has the distressed finish to add to the modern look of this hat. Other features include a metal concho, a corded band chin strap, and a double layer cotton head band. As I mentioned above, Raffia is a premium type of straw, which makes the hat soft, cool, and comfortable to wear. In addition, the tight straw weave and vented pinch front hondo crown with a 50+ UPF rating. This fabric will keep harmful sun rays off your face while keeping your head as cool as can be. Not to mention that the material is tough and durable that it will last for several seasons. It is resistant against daily wear and tear and will also age nicely. Go for this cowgirl hat if you want to have a bold and adventurous cowgirl look. With its strengths and its ability to protect your skin, you can use this hat when you take part in outdoor activities such as camping, hiking, and going to the beach. Since it is foldable, you can also take it with you when you go travelling as well. 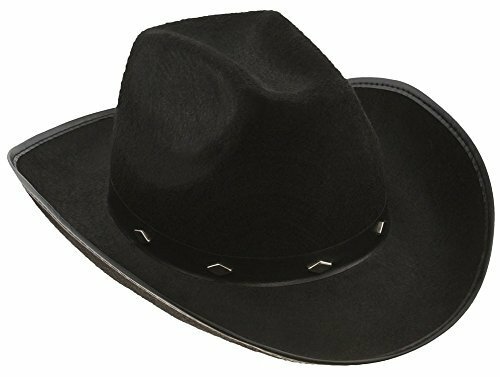 If you are looking for a formal cowgirl hat, take a look at a felt hat like this one from Enimay Western. This cowgirl hat for women is made of 100 % of felt material featuring the classic cattle man. You can choose among 15 options of colors including black, natural white and khaki. The material of this cowgirl hat is of premium quality so that it is weather resistant as well as durable and long lasting. The felt material of this hat is of high quality to be very soft and smooth when you tough it. It can keep you warm in the cool autumn days while being very well ventilated and breathable. In addition, don’t worry that the felt material will make you feel hot. In fact, with the elastic head band, your moisture will be wicked away and your head will be kept dry and cool all of the time. 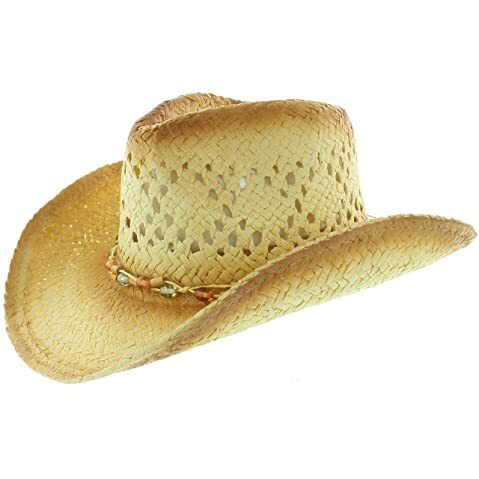 Not to mention that thanks to the elastic head band, this cowgirl hat will fit nicely on your head and cause no irritation to your forehead at all as it can prevent rubbing effectively. 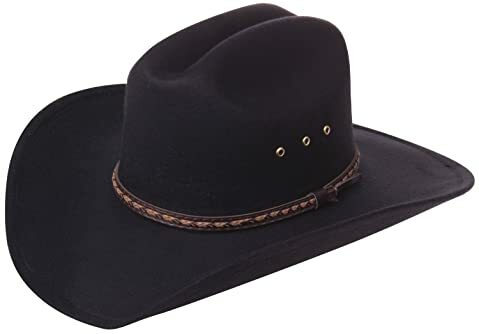 And last but not least, while this cowgirl hat is made of a thick layer of felt material, it has a nice and light weight that will not make you feel burden at all when you have to wear this hat all day long. This cowgirl hat is made of 100 % of wool blend while the belt band is made of 100 % of leather. There are several choices of colors for you to choose from such as black, navy, red and pink. The wool blend material which is used to make this hat is of premium quality, like other high quality cowgirl hats that you can have on the market. Therefore, it is soft and smooth. Not to mention that it is thick and warm enough for you to wear in the cool days. All of the details on the hat band are nicely and carefully made. Those metal details are stitched nicely on the band. They also look vibrant and shiny and will surely bring you a glamorous look that you need. The leather band is also of premium quality that is resistant against scratches. Last but not least, the belt band of this cowgirl hat can be taken off. Of if you don’t want the shiny look that the belt brings, you can take it out to have a formal look for the hat in case you need it. The solid looking cowgirl look of this hat will make it easier for you to pair it with other pieces of your clothing. It will surely go nice with your simple T-shirt and jeans. Keep in mind that this hat is for hand wash with cold water only. Otherwise, the material of the hat will degrade and it will lose its form. The wool blend material is quite sensitive and hence, you could not crush the hat or pack it into a small bag. This Glitter sequin trim cowgirl hat is made of 100 % of polyester. The entire cowgirl hat is accented with glitter style sequins and a sequined band. There are several options of colors for you to choose from such as red, white, light pink and blue. 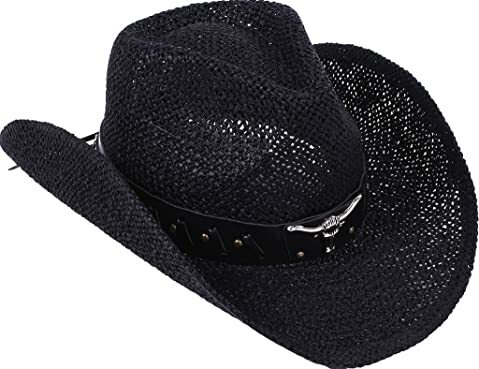 My choice is the black cowgirl hat which will give me the shiny look in night party. If you like something more colorful, you can still have different bright and unique choices of colors to choose from. You can opt for this stylish hat for date nights or friend gatherings as well. The material of this cowgirl hat is of premium quality which is cool and well-ventilated. It makes the hat comfortable to wear even when it is hot outside. In addition, the hat is well made for a sturdy and durable construction. Keep in mind that this cowgirl hat features glitter and sequins. Hence, the best way to clean this hat is to spot clean it. This cowgirl hat is available in 3 options of colors- we have black and brown as well as the pink cowgirl hat. It is made of felt material with metal studs running on the felt hat band. 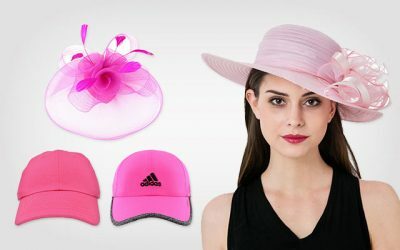 This hat is good to go in semi formal parties, theme parties as well as other fun occasions you can think of. In addition, you can wear this hat in the cool days without worrying that your head will be sweating or freezing. First of all, the material of this hat is among the most premium felt and wool blended materials that you can ever find. It is soft and smooth. It also has a decent thickness to keep your head warm and retain the heat well in the cool day but it is also very breathable. Another thing that I love about this cowboy hat is that it doesn’t trap hair as well as dirt easily. Second of all, the brim of this Kangaroo hat is so wide that it is capable of covering your face as well as your ears and your neck, keeping them away from the harsh sun rays. As a result, you don’t have to worry much about your face when you take part in outdoor activities such as hiking or camping. And last but not least, the construction of this hat is also very sturdy and solid. Not to mention that it would not change form easily. When ceases and marks appear on the hat, it is also very easy for you to flatten the hat by steaming it or ironing it with care. 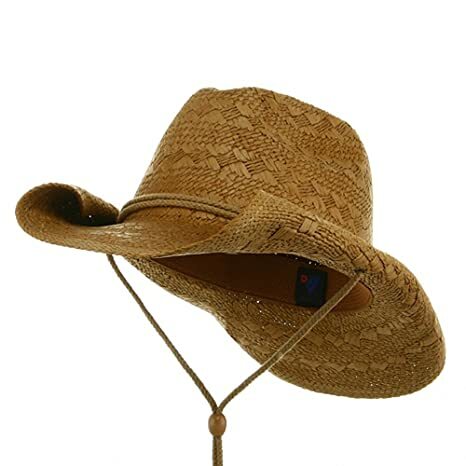 This cowgirl hat from The Stagecoach is made of 100 % of straw. It is available in natural colors as well as other bright colors such as red and orange. These colors are quite sharp and vivid which will not fade away easily regardless of how frequently you wear the hat. The straw is definitely the natural straw which is processed nicely for the comfort and breathability. In addition, the brim of this hat can be folded up and down and you can reshape the brim in many ways as well. While the brim is soft, it will not become flimsy at all in case of a high wind. Besides the high quality straw, this hat also has an inner head band. The head band helps to adjust the hat around your head and makes sure you feel the most comfortable wearing it. In addition, it prevents the straw material from rubbing your forehead, preventing any irritation possible. Another thing worthy about this hat is that you can easily crush and fold this hat, packing it into a small bag. 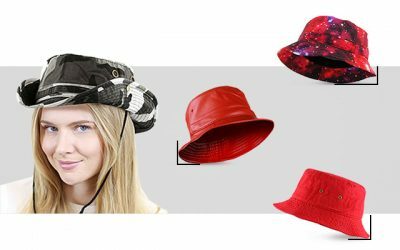 If you need some kinds of hat that you can carry with you when you travelling, you can well consider this hat. With this straw hat of the simple yet fashionable look, you can wear this cowgirl hat when you go out at the beach, hiking, or camping. It also makes you look trendy and adorable in a music festival. This cowgirl hat will surely catch you attention with trendy and fashionable design. 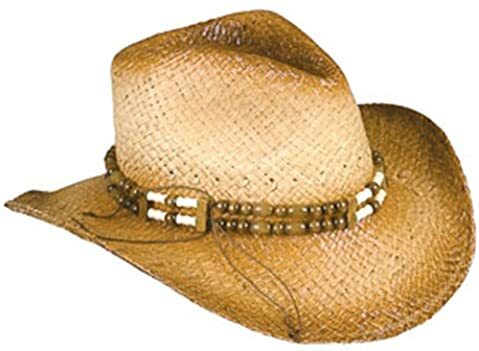 It features the premium dual-tone stained straw hat with a beaded headband and a rolled up brim. It most distinctive feature which makes it look like no other cowgirl hats on the list is rugged two-tone color scheme. The intricate arrangements of beads on the hatband are nicely done for an impressive and shiny look. These arrangements are also made of premium quality that they would be bright and shiny for a long time. And like some other woven straw hats on the market, this hat has the brim which is shapeable thanks to its built-in wire. With such feature, you can choose to style up the brim as well as the look of the hat to the style that you desire. On the other hand, the construction of this hat is firm and solid, which helps the hat to maintain its form for a long time. The hat is made with an excellent craftsmanship so that all of the details on the cowgirl hat are nicely done for extra durability. You can wear this cowgirl hat to a wide variety of occasions- from themed parties, to birthday parties and other kinds of parties. The last cowgirl hat I want to review is this cute and unique hat from Boho Hip. This cowgirl hat is made of 100 % of Tokyo straw, which is a premium material for a soft and lightweight hat to wear in the summer. The hat is sewn nicely so that it is cool and breathable for you to feel comfortable wearing this hat in the summer. There are several options of colors for you to choose from including pink, blue, white, and natural. All of these colors are bight and vivid. They are also resistant to the impact of the external factors and will remain their shades nicely over time. The decoration on the hat band is a shape of heart- which can give you an instant cute and adorable look. The brim of this cowgirl hat is 3.5 inches in width. It means that the brim of this cowgirl hat is wide enough to protect your face as well as your neck and your ears in case you have to go out in a board day light. In addition, the brim features a hidden wire along the edge for you to curve the brim up and down. You can easily change its shape to the look that you like. While this cowgirl hat is available in 1 option of size, it has the soft elastic sweatband to help you have a comfortable fit with this hat. Not to mention that the sweatband is capable of wicking sweat away as well as keeping your head cool and dry. It is definitely a cowgirl hat for the summer. Not so long ago, the choices of cowgirl hats on the market were as plentiful as the choices of cowboy hats. Now, you girls have thousands of choices of different styles and designs to consider. There are cowgirl hats for parties, festivals, for casual wear or beach wear. They are different in materials, design and colors. The choice you would have is endless. You can choose a cowgirl hat to wear when you go to a theme party, a summer musical festival or a night out with your friend. It is also a great item for you to wear with your Western inspired clothes. I hope with the list above, you would be able to find the one that meets all of your needs and requirements in a short time. With a stylish and high quality Western cowgirl hat, I am sure that you will be able to create a strong fashion statement or enjoy wearing the hat in the style that you like. Nice review!! Yes! Have tried these and loved them!